Speculative early map of Siberia based upon the journals of Marco Polo. 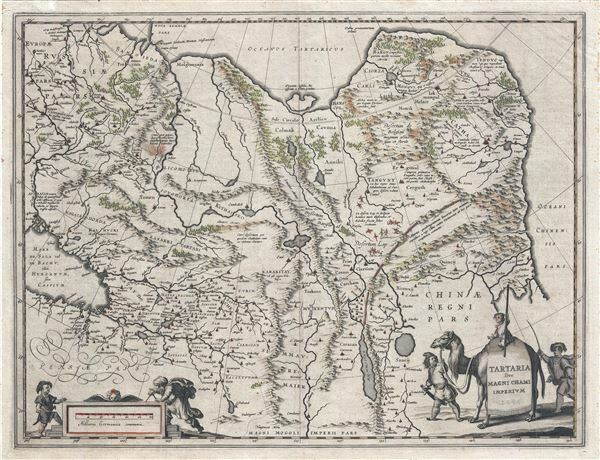 A fine c. 1645 map of northeast Asia (Siberia or Tartary) by J. Blaeu. The map covers from the Caspian Sea and the Volga River east as far as the China Sea and the city of Xanadu. It extends north to Nova Zembla and south to the Upper Ganges River. When Blaeu drew this map this part of the world was almost entirely unknown. Blaeu relied on the journals of Marco Polo to compile most of the map. Devils and dragons frolic in the Lop Nor and far to the north the summer seat of Kublai Khan's Yuan Empire Xanadu (Shangdu) is noted. The Great Wall of China appears prominently. Further west, the Geography becomes more stable with recognizable Silk Route centers such as Samarkand clearly identified. The title is set into a saddle blanket on the back of a dromedary. Mountains and forests are rendered pictorially. This map is distinguished from Jansson's very similar map by Blaeu's inclusion of degrees of longitude along the borders and meridians crossing the map. Issued in the 1645 German language edition of Blaeu's Atlas Major. Blaeu, W., Atlas Major, (Amsterdam) Germany Edition, 1645. Very good. Back with fine japanese tissue. German text on verso. Minor discoloration upper left quadrant. Koeman/V.d.Krogt, Atlantes Neerlandici, Vol.2, 112.2. OCLC: 224308027.